A few months ago, Kyocera Document Solutions Inc. launched two new A3 color MFPs, the TASKalfa 2552ci and 3252ci - and now they are rolling out the rest of their new range. The A3 color TASKalfa 4052ci series, 5052ci and 6052ci (which replace the 3551ci, 4551ci and 5551ci) and A3 monochrome series TASKalfa 3011i, 3511i, 4002i, 5002i and 6002i (which replace the 3010i, 3510i, 3501i, 4501i and 5501i) are now available in most countries. 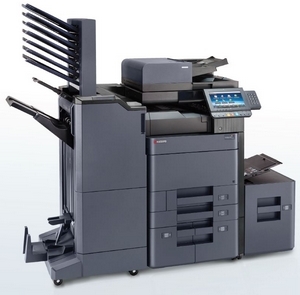 Aimed at small- and medium-suzed businesses, these MFPs feature the latest technologies from Kyocera. With print speeds of 25 ppm to 60 ppm, these machines have the latest toner technology and long-lifetime Kyocera amorphous silicon drums (as opposed to organic photoconductor (OPC) drums. Print resolution can be up to 1200 x 1200 dpi, paper capacity up to 7,150 sheets and the optional single-pass feeder can run at up to 160 ipm. A Fiery controller is available as an option on the MFP 3252ci, 4052ci, 5052ci and 6052ci. Mobile printing and new trends related to mobile devices are catered for. NFC for Android devices is available, and they support AirPrint, Google Cloud Print, Kyocera Mobile Print and many other sorts of applications developed by the manufacturer and third parties (running on the HyPAS platform). They are also equipped with a 9-inch touch-screen interface which can be tilted 90 degrees. Plus there's a novel approach to saving consumables: the new TASKalfa range's toner cartridges are locked in place until completely empty - and the black one is deisgned to be the same form as teh waste toner bin, so it can be used as such. The Kyocera Fleet Services app can alert the service provider to deliver a new cartridge, as well as providing remote configuration features. Full technical specs as well as their strengths and weaknesses are already on Your DMO! Kyocera Document Solutions have asked us to test and evaluate a 2552ci and a 4052ci in the next few weeks - so watch this space for full lab analysis coming soon!